YOUNGSTOWN, Ohio (WKBN) – One of Youngstown’s oldest landmarks will soon be coming down to make more room for the Chill-Can plant that’s under construction on the east side.The old Immaculate Conception Church has sat on Oak Street for 130 years, but it’s been closed for the last seven.The city is close to an agreement to buy the church and the plan is to have it demolished. “We’re standing — literally — in the past, looking at the future,” said First Ward Councilman Julius Oliver.The church is in Oliver’s ward and he supports the plan to tear it down, though no demolition date has been set yet. “I haven’t seen a group stand up and say, ‘We’re going to raise money to save Immaculate Conception.’ I haven’t seen it placed on a historic registry,” Oliver said. The church has been closed since 2011 and ever since then, it has been vacant.”Everything, at some point, has to come down and it’s time for a change,” said Kennedy who owns Royal Oaks bar, which is a block away from the church. He, too, supports tearing it down — he’s been inside. “We thought about putting a banquet hall in there, but all the pews are gone, the furnace was gone at the time, it’s not in a real good state of repair,” Kennedy said.Immaculate Conception’s cornerstone reads 1888, making it the oldest Catholic church in Youngstown. It was an Irish parish that served the immigrant families who made up the once vibrant neighborhood that surrounded it.After the neighborhood depleted and the families were long gone, Immaculate Conception closed and was later sold. Now Chill-Can has taken over. Chill-Can owner Mitchell Joseph was baptized at Immaculate Conception and attended many weddings there. He said he’ll try to accommodate people who want keepsakes, but most everything of value has been removed. 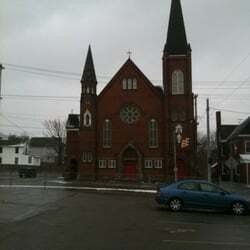 Joseph also said the rectory next to the church will be saved for now and may be used as a construction field office. The school across the street will also remain. Joseph envisions the school possibly being used for offices or a medical building.The agreement to buy the church and eventually tear it down hasn’t been finalized yet.